Edge Pest Control’s Andrew and Blaine Richardson hold a banner with Principal Kate Ross during the Feb. 12 donation ceremony at Lindon Elementary. 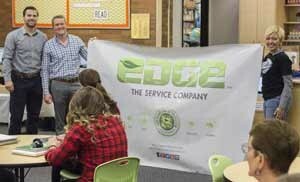 Lindon, Utah-based Edge Pest Control recently teamed up with the Lindon Parent Teacher Association (PTA) to purchase and donate a new copy machine and duplicator to Lindon Elementary. These donations came as the elementary school’s previous copy machine and duplicator, used daily to print materials for students, broke down just after winter break. Ross says the elementary school staff and faculty are extremely grateful for the donation, which was sufficient to cover the entire cost to replace both machines. “Truly, we could not do what we do every day without the partnerships of our school and business communities,” she says.